summer would be mild mannered this year. Why, we had one day with 69° as the high. Rain came, torrential rain came. A city nearby had 14" in one 24-hour period. Could this be north Texas?! Two more days followed with highs in the 70s. but the reason was the delightful temperatures. that celebrated how I was feeling about the weather. The larger sign was inspired by Pinterest. Between Pinterest and Blogs, I find all kinds of inspiration. Enough for a hundred years of projects. instead of painting the phrase. 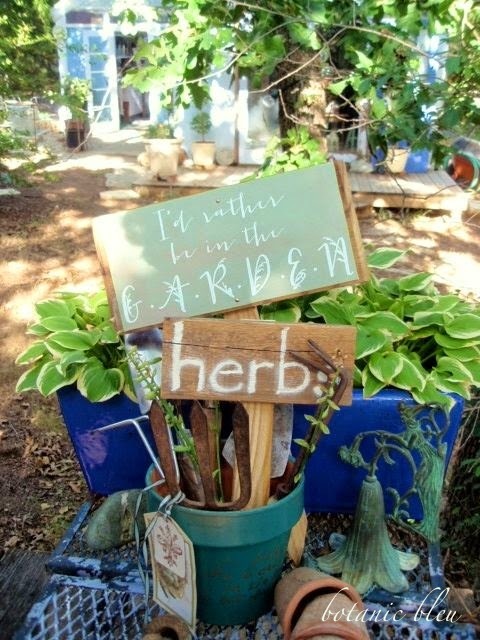 Directions for creating the "I'd rather be in the garden" sign. Insert Text Box so different fonts can be layered. 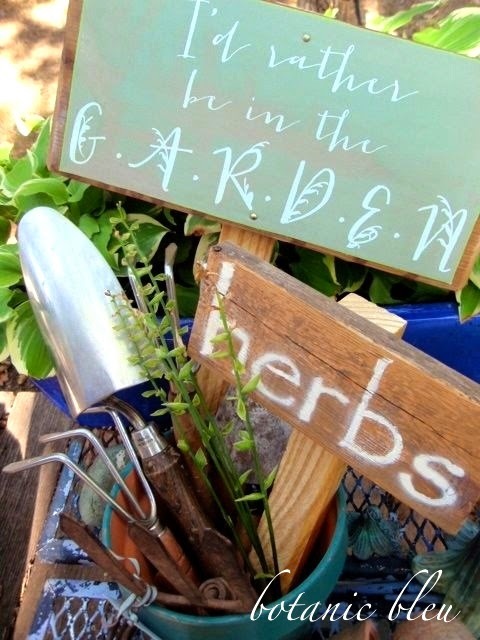 That's how the plant sprigs were added to the letters in the word "GARDEN". Fonts used - Jacques and Gilles for the words and Bodoni Ornaments for the sprigs. "Fill" the text box with background color of choice. Use a very pale color for the text color. This is how to get the text color to look almost white. Let the printed sign dry. 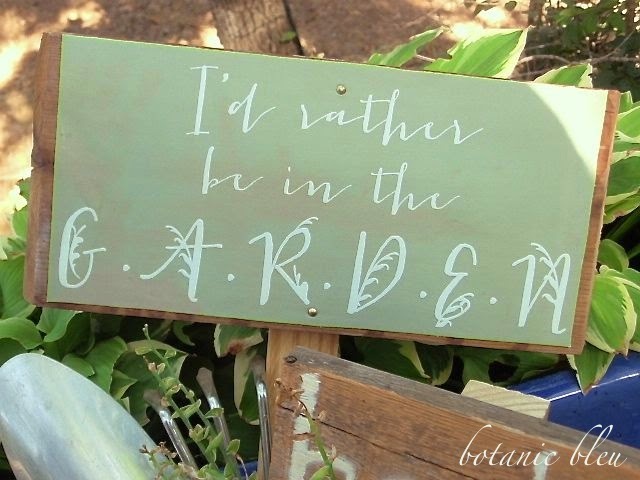 Spray the canvas sign with Rust-Oleum Matte Finish - Clear Protective Finish for Crafts, Arts, and Decorative Projects. Find at Home Depot. 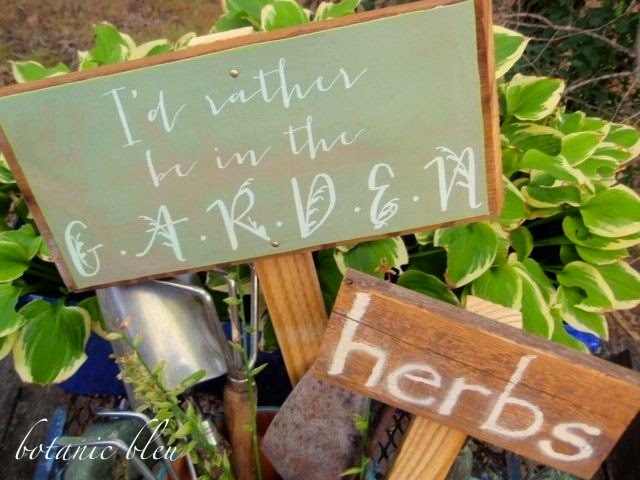 Glue canvas to weathered reclaimed scrap wood found underneath your deck (that's where mine was.) Use Elmer's Carpenter's WoodGlue Max, waterproof and stainable, interior/exterior. Nail the sign to a stake - Grade Leveling Stakes found at Home Depot come in several lengths. I used an 18" stake for this sign. The sign is water resistant, not water proof, and should be used in sheltered areas. Mine did get sprinkled on during one of our most-welcome rainy days before I got it inside. The water beaded up, and the ink did not run. Whew! The Grade Leveling Stake is 12" long and cost 25¢. Spray the sign with Rust-Oleum Matt Finish to protect it. 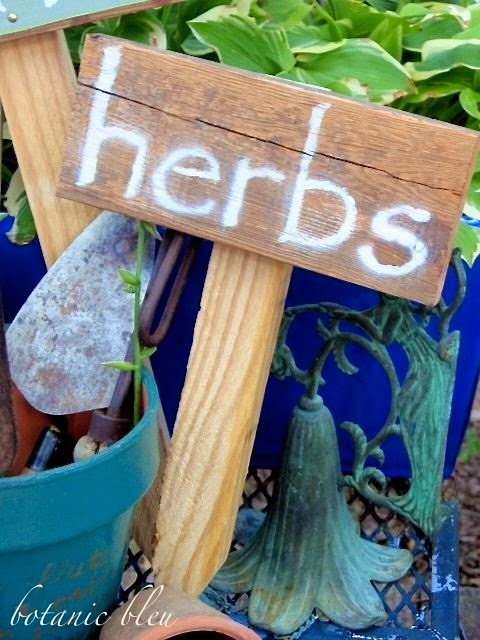 The herbs sign is water proof and can be used outside. the temperature on my car's dashboard at 7:00 p.m. tonight. Good morning Judith! I am with you in observing the summer temps this year. We too had a very wet start and we continue to have clouds rolling in to announce yet another storm. Our lakes and creeks and rivers are overflowing into the highways with FISH swimming on sidewalks now under water. But I think the heat will roar in like a lion for us, especially in August when I go back to the classroom at the end. We simply don't know what this weather pattern is going to give us! We have had some strange plant diseases kill off our inpatiens, and everything is too moist! 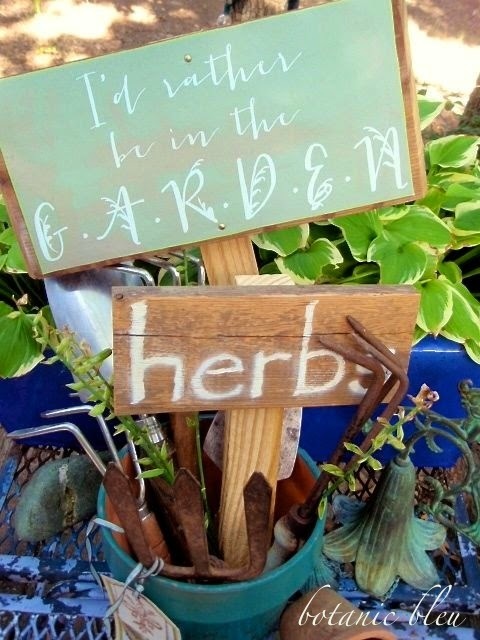 I love your little signs! I had wanted to do something similar with poetry - I had seen a poetry garden in town, and wanted to follow suit, only the poetry is engraved into stones!!!!! How about that! Your signs are so nice, Judith! I haven't tried that canvas to print on yet either. Sometimes I am very slow to get to these things. : ) We have been having wonderful weather here, too. A couple of very warm days, then a storm, then it is cool with no humidity. Perfect weather to me. If only it will stick around all summer! What darling signs. I never thought of using that canvas paper. Your days are really hot. Here in western pa we rarely see a day in the nineties. Our summers are glorious but very cold winters come early. I'm a daily reader of your blog and enjoy it so much. LOVE your signs, Judith! I've been thinking this is the coolest summer we've had in years. We're expecting heavy rains most of this week... then perhaps those warmer temps will finally reach us as well. Both of your signs are very classy and I appreciate it that you would share technique. I love your choice of fonts! 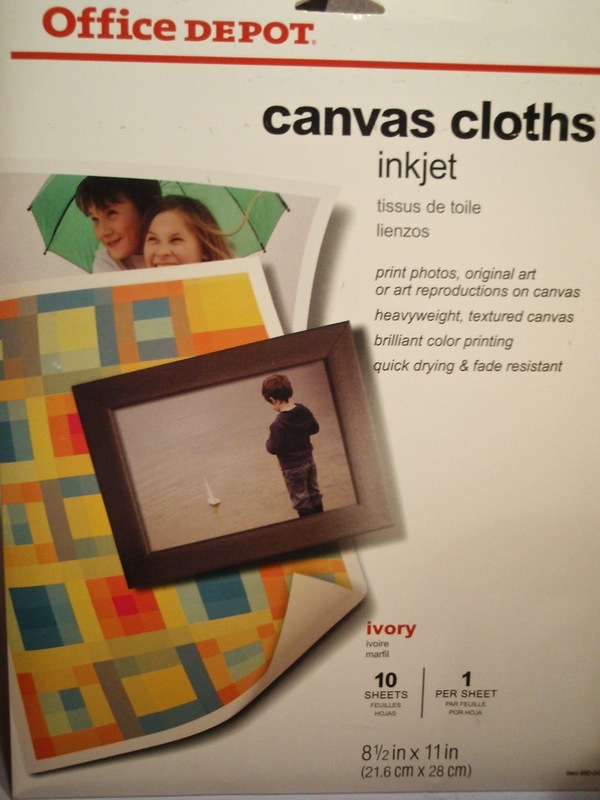 I just happen to have some canvas paper, so I will need to give this a try. The signs are peaceful and do not speak of the sweltering conditions. I really do feel for you.